Ride-hailing cabs such as Uber and Ola have positively changed the way people travel in Kochi and Thiruvananthapuram with comfortable travel and cheaper fares vis-a-vis other car taxis. KOCHI: Ride-hailing cabs such as Uber and Ola have positively changed the way people travel in Kochi and Thiruvananthapuram with comfortable travel and cheaper fares vis-a-vis other car taxis. But yet, there was no escape from the traffic blocks and last mile connectivity. Now, a slew of bike taxis which can snake through traffic blocks to get people to their destinations at a fraction of the time that a cab takes, are ready for launch in Kerala. The likes of Baxi, UberMoto, Bikxie and Thiruvananthapuram-based IGLU Innovation are all set and are knocking at the doors of the Transport Department for approval. The Indian Motor Vehicles Act did not allow two-wheelers to operate as contract carriage till November 2015, after which seven states viz., Haryana, UP, Rajasthan, Madhya Pradesh, Gujarat, West Bengal and Telangana, opened up the regulation allowing the entry of bike taxis. Kerala is yet to bring out a notification allowing two-wheeler taxis. IGLU Innovation’s founder and CEO Kannan Parakunnil, who is interacting with the senior officers of MVD in Thiruvananthapuram, said the government could notify the changes in the MV Act to allow the entry of bike taxis in Kerala. “We are planning to start with 10-20 bikes. The MVD has been supportive during the discussions,” Kannan said. Rajeev Puthalath, joint transport commissioner, Kerala, told ‘Express’ the department would first bring out a new set of guidelines for bike taxis, before giving them the green signal. “We had an internal discussion. This is a new area, and hence we need to bring out a new set of guidelines for bike taxis. For instance, whether women can travel on such two-wheeler taxis; whether women should be allowed as taxi drivers. We don’t want to get into problems later,” he said. This fear appears exaggerated as bike taxis operate ‘pink service’ for woman commuters. 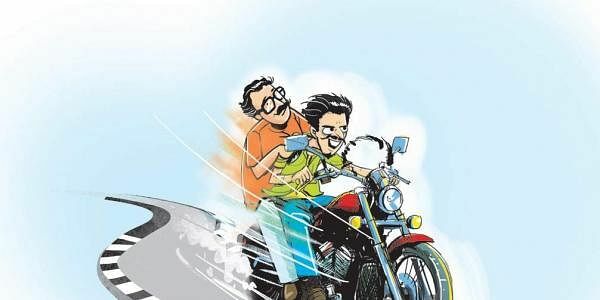 Baxi team member Rohit Koshy said the startup was ready for launch in Kerala, adding bike taxis would boost part-time employment among youngsters, besides giving another travel choice for daily commuters. “Bike taxis will not affect autorickshaws. We are only looking at a single passenger while those with luggage or 2/3 people travelling together always opt for autorickshaws,” he said. She said the fares were very competitive and transparent compared to the parallel services across the country.